Today, children in Blue Class were investigating bread-making in a mixture of Science and DT lessons. We made three batches of bread, one with no yeast, one with 2tsps of yeast (as per the recipe) and one with 4tsps of yeast (double the recipe). We left the dough to rise and this is the result. We will be making some bread rolls from the dough later this afternoon, so watch out for some photos of the finished products later! On Monday, pupils from the School Council and Eco-Council took part in a training session with Mr Barkley from Uniservity on how to use the school's Learning Platform. The children learnt how to login and edit their own e-portfolios and then began creating wikis for the School Council and Eco-Council pages (log in to view these pages). A Rather Chilly Start To 2009! 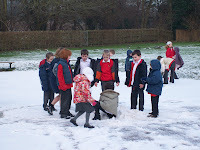 A number of children braved the 'Arctic' type conditions to make the most of the recent snowfall. 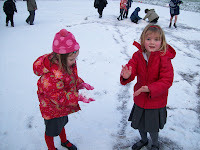 The children that wanted to 'experience' the wonders of the white stuff got up to all sorts including igloo making attempts, snow castles and the good old-fashioned throwing it at the teachers. The children were superbly well behaved and not a single child fell over, although Mr Mansell did have a rather slippery moment. 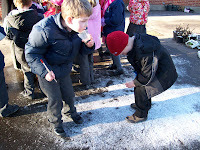 the snow and looked at how long it took to melt once back inside. All-in-all, a very interesting, if somewhat chilly week. Who knows what the weather will bring us next week! ?